Sunday Services usually follow Holy Communion: Order One from the Church of England’s Common Worship. Hymns are mainly taken from Common Praise. 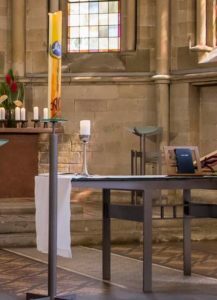 Readings follow the Church of England’s Common Worship Lectionary. During the service the children usually go over to the Anglican Centre for Sunday School. When there is a 5th Sunday in the month the service takes the form of a German-English bi-lingual service, hosted alternately by the Old Catholics and St. Catherine’s. Coffee follows the 11:15 service in the side room of church or the Anglican Centre. Seasonal events are held on Ash Wednesday, Maundy Thursday, Good Friday, Easter Vigil and other principal feasts. An annual highlight is the service of Nine Lessons and Carols held in the Leonhardskirche.